I am fighting with my older sister of bobbed hair. competing with each other's kitchen knife. I feel outright murderous intent from my older sister. It is by no means fun. I happened to get a kitchen knife from my sister this time. It's made of transparent glass. It cracks if it cuts with a metal knife. "Oh well, you did it, I will kill you." The voice of my older sister who disappeared. A structure of a house like a cubic small room connected. Reminiscent of the jungle gym. I can not remember why this situation happened. Suddenly, my sister appears in the hallway. Turn here and show it with a white handkerchief with both hands. She comes close to me. "Stop, do not get any closer." "I want to go to the toilet." Indeed, there was a toilet behind. Still my sister's progress does not stop. 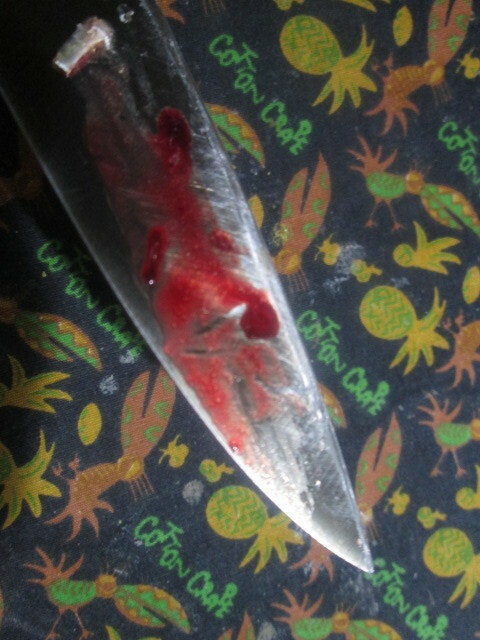 on the edge of the kitchen knife that I stuck out. Blood blisters in my sister's clothing at the chest. "I can not hold it"
However, it may be a cowardly strategy, I can not bring knives. She may be hiding a weapon. "Let me go to the bathroom." and my sister 's blood began to hang to the floor.